At ZipBooks, we know that saving time is a good thing for busy business owners. That’s why we set up your account to do certain things automatically. Like when it comes to invoices and estimates. There are certain things you need to put on every one, and that information might be the same every time. 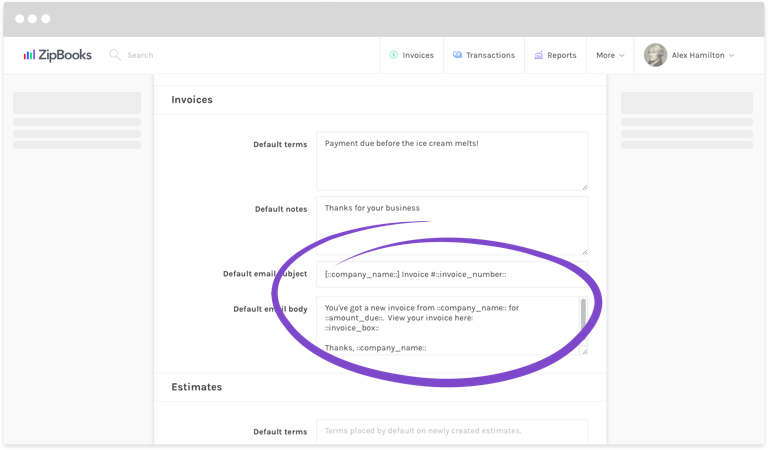 So we’ve set up defaults that will automatically populate in your invoices and estimates so that you don’t have to enter them over and over again. However, when you want to customize your invoice and make it your own, it’s easy to do that too. Log in to ZipBooks and click on More at the top of your screen. Click on Preferences under the Account heading. For Invoice-specific settings, toggle on or off any preferences and edit Default terms, notes and email text. Note: Make sure to keep the formatting the way it is (example – ::company_name::) in order for ZipBooks to pull unique information from each customer into the email. These are called dynamic variables. You can use any number of them in your emails in order to produce the information you need. For Receipts, specify what you want in the Default email body of all receipts you send to customers. And you’re done! Spending a little time getting this information right will save you a whole lot of time in the future. How do I pause an active recurring profile?